For floors that are difficult to coat, we recommend using clear, colorless UniBond 110 bonding agent/primer. UniBond110 is a single-component, single-coat moisture cure bonding agent and primer used to promote adhesion to difficult-to-bond surfaces such as glass, ceramic tiles, porcelain, steel, aluminum, brass, concrete and some plastics. 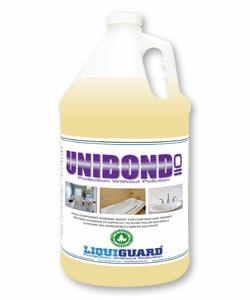 UniBond 110 is appropriate for use prior to the application of Liquiguard coatings (such as SolidStepCote) and coatings from other manufacturers on difficult-to-bond surfaces or in circumstances where the final coating is likely to encounter abrasion, exposure to oils and liquids or heavy traffic within the first 24 hours after application. Under such circumstances, the use of UniBond 110 will help to prevent delamination of the top coat from the substrate and other potential coating failures. Coverage is approximately 250 square feet per quart (1000 square feet per gallon), but porous surfaces may need more. Just wipe on with a microfiber cloth and allow to dry for a minute or so, and you’re done. Here is the SDS for Unibond 110. *no shipping charge for orders over $120!! 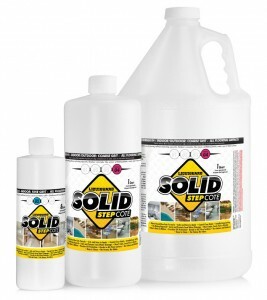 One gallon covers approximately 192 sq ft with two coats. Got questions or a special order?